Beth Ann & Jessica's Helpful Savings: Dairy Queen: Buy $15 Gift Card, Get Free Small Premium Fruit Smoothie! 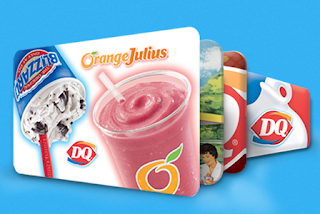 Dairy Queen: Buy $15 Gift Card, Get Free Small Premium Fruit Smoothie! Receive a FREE Small (12oz) Premium Fruit Smoothie when you purchase a $15 Gift Card! * That's pretty sweet!